A more or less random look back at the Presidents of the U.S.
Barack Obama who won't be covered in this series, as only ex-Presidents need apply. For Franklin D. Roosevelt to be elected President four times, he had to be elected a first time. Donald Ritchie’s book gives a quick look at how this happened. Ritchie spends more time writing about the loser in 1932, Herbert Hoover, than Roosevelt, and tries to make the case that Roosevelt’s win in 1932 was not exactly a foregone conclusion. 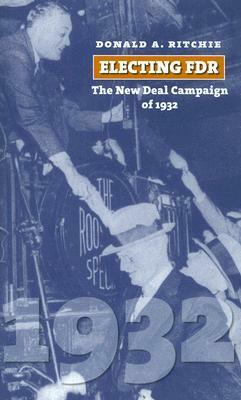 Hoover’s missteps during the Depression were numerous. He signed a bill raising the tariff to ridiculously high protectionist levels. During periods of great hunger in the country, he would only support Federal funds for seeds and food for livestock, not food already made for people to eat. He felt that would be teaching people to rely on the government to eat. Instead of starving to death. They may die, but at least they learned a lesson. The biggest fiasco was the Bonus Army. In June 1932, a large group of unemployed World War I veterans marched on Washington to demand an early payment of a bonus they were supposed to receive for their service. It was budgeted for 1944. And Hoover thought they should wait to 1944. Hoover wanted the Bonus Army removed from Washington. He ordered the Army, under the leadership of Douglas MacArthur to evict the group. Hoover ordered that no weapons be used. But, MacArthur, claiming that they were all Communists, sent his troops marching in with sabers and used tanks as well. Even in an era before television, the images were devastating to Hoover’s image. The Democrats had earned a small majority in the House in the 1930 elections, elevating John Nance Garner of Texas to the Speakership. The Republicans still held a small majority in the Senate, but Hoover asked the Democrats to caucus as the majority because he thought they would be easier to deal with. The Republicans declined to do this. Democrats started to line up to run against Hoover in 1932. Garner was one candidate, but he hated actually running for office. He had a safe district and he liked being Speaker. But, he still had ambitions. The other candidate was the charismatic governor of New York, Franklin Roosevelt. Roosevelt had won the governorship in 1928, replacing Al Smith, who had lost to Hoover in 1928. Smith expected Roosevelt to ask him for advice frequently. Roosevelt didn’t and the two men headed on a path to estrangement. Al Smith may have been the Happy Warrior, but he was also rather petulant. When the Democrats convened in Chicago in 1932, Roosevelt came in with momentum, winning most of the primaries, although few of those produced much in the way of delegates. Still, Garner, along with Smith, did not arrive with much support either. But, the Democrats still required any nominee to get 2/3 of the delegates to be nominated. Roosevelt’s supporters assumed he could hold on to his support for three or four ballots at most. It took five ballots to nominate Roosevelt, spurred by California’s William McAdoo (who was one of the losers in the 1924 deadlock), who threw California’s support to Roosevelt. Smith finished second and was so peeved that he declined to let his delegates make the nomination unanimous. Garner was given the second slot. Roosevelt broke with tradition by flying to Chicago to accept the nomination in person. Previously, candidates would give their acceptance speeches either in writing or a few weeks after the convention. Hoover assumed he wouldn’t have to campaign much. He assumed that the American people would assume that he was too brilliant and too hard-working that he didn’t have to sully himself with going out on the hustings. That idea was soon discarded when the Republicans realized that they were in big trouble. Roosevelt campaigned all over the country, which helped to dispel the notion that he was too disabled from polio to be an effective leader. Roosevelt campaigned on a plan called “The New Deal” which would include numerous government programs to help get Americans working. There were also plans to create Federally owned power companies and even more liberal ideas, all crafted by a coterie of liberal intellectuals who advised the campaign. Hoover had no firm plan, counting on private charities to help with short-term needs like hunger and shelter. When Hoover campaigned, he found crowds hostile to him, something that he couldn’t understand. Why would anyone be mad at him? Hoover majored in geology at Stanford, not self-awareness. As the campaign moved on, the Democrats became more confident in their chances. The Republican congressional candidates ran away from Hoover. There was no sophisticated polling at the time, but it wasn’t hard to tell who was going to win. Most newspapers were endorsing Roosevelt, including those run by William Randolph Hearst. The election was not close. Hoover suffered the biggest loss by any incumbent in American history up to that time. Roosevelt won 57.4% of the popular vote and had 472 electoral votes to Hoover 39.6% and 59 electoral votes, all of them in the Northeast. The book finishes up with a discussion of Hoover’s declining political career and dislike of Roosevelt. (The two men barely spoke after the election or on Inauguration Day.) Hoover thought the Republicans might draft him to run again in 1936 or 1940, but his name was political poison. Hoover may have been the sorest loser in a Presidential election ever except for the two Adamses. 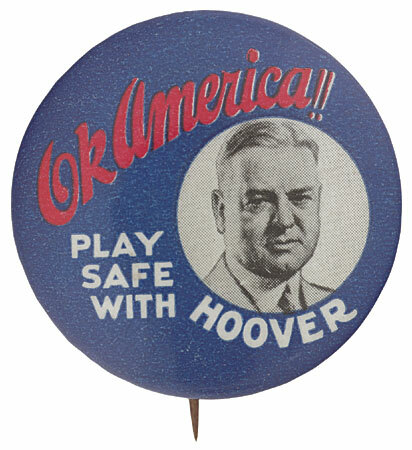 Hoover would be rehabilitated in public opinion when Harry Truman became President. Truman asked Hoover to head up a government efficiency commission. (Hoover loved to look for inefficiency, it was pretty much the only thing he was good at.) When the Republicans regained the White House under Dwight Eisenhower, Hoover thought he might get some other duties. But, Eisenhower did not like Hoover. It wasn’t until Richard Nixon ran in 1960 did Hoover find a Republican candidate that looked up to him. In Washington now, there is a memorial dedicated to Franklin Roosevelt on the National Mall. It has statues depicting events in the life of Roosevelt, including the Depression and World War II. It is quite heroic. The Department of Commerce Building is named for Herbert Hoover. It has a nice food court. Brother can you spare a coin that has my face on it? With the exception of Abraham Lincoln, no American President ever faced crises of the scope that Franklin Delano Roosevelt did. He entered the White House as the nation was in the throes of its worst economic situation ever. When he died twelve years later, the country was the preeminent economic and military power in the world. And if you were alive in 1932 when Roosevelt won his first term in office, you would have been quite surprised to think that this man would have been able to accomplish so much. Roosevelt’s accomplishments before taking office would not have have led you to believe that a radical restructuring of the American government and economy would take place. Roy Jenkins, a British author who served in both houses of Parliament, tried to sum up the extremely complicated life of Franklin Roosevelt in about 180 pages. Jenkins passed away in January of 2003, a few months before this book was published. Jenkins chose not to examine Roosevelt as some sort of larger than life figure, but rather as a politician who worked his way up the system. Jenkins clearly is in Roosevelt’s camp; but, he isn’t afraid to point out Roosevelt’s flaws. And if you thought Jenkins had a hard time compressing Franklin Roosevelt’s life into 180 pages, it’s even harder trying to write this post in anything resembling a concise manner. But, I’ll give it a shot. Franklin Roosevelt was born into a wealthy family in Hyde Park, New York on January 30, 1882. There were two prominent branches of the Roosevelt family in New York. Franklin came from the Dutchess County line, which was mostly Democratic, in contrast to most of the residents of the area. Theodore Roosevelt came from the Oyster Bay (in Nassau County on Long Island) line, who were nearly all Republicans. The two sides of the family had a merger of sorts when Franklin married his fifth cousin, Eleanor, in 1905. Theodore Roosevelt escorted Eleanor (his niece, her father had already passed away) up the aisle at the wedding. As a wedding “gift,” Eleanor got the “privilege” of living with Franklin’s mother, Sara, for the next 36 years. Sara Roosevelt was: domineering, possessive, rude, dismissive, and otherwise decidedly unpleasant. Franklin Roosevelt had been educated at Groton and Harvard, where he was never known as an especially bright student. Soon after his marriage, Roosevelt entered Columbia Law School. He never graduated from there, but he did manage to pass the New York State Bar Exam. In 1910, Roosevelt made his first foray into politics, winning a seat in the New York State Senate. By 1913, Roosevelt’s stature had risen to the point that he was named Assistant Secretary of the Navy by President Woodrow Wilson. Franklin Roosevelt was now in the same position that Theodore Roosevelt occupied before the Spanish-American War. During his time in this job, Franklin had an affair with his secretary, Lucy Mercer. When Eleanor discovered this, she offered to divorce Franklin. Ultimately, they both decided it would be a bad idea politically. Eleanor chose from then on to support her husband politically, but not conjugally. It turned out to be one of the most powerful marriages in American political history. Eleanor constantly steered her husband onto a more leftward course, one that was far more liberal than people would anticipate coming from a wealthy scion of Dutchess County. Roosevelt was nominated by the Democrats as their Vice Presidential candidate in 1920, but lost badly. A Republican wave carried Warren Harding into office. Just one year after the election, Roosevelt’s life changed dramatically. In August of 1921, while vacationing at his summer home in Campobello, New Brunswick, Roosevelt contracted what was widely considered to be a case of polio. (Late in 2003, some doctors cast doubts on this diagnosis and suggested that Roosevelt actually had contracted Guillain-Barre Syndrome.) Whatever the cause, Roosevelt would never have full use of his legs again. In 1924, Roosevelt made his political comeback when he was able to walk (using very heavy leg braces and some assistance) to the podium at the Democratic National Convention in New York City to deliver a nominating speech for New York governor Al Smith. Smith didn’t get the nomination in 1924, but he would four years later. This meant that New York would need to have a new governor. Smith suggested that Roosevelt run for the office. Jenkins portrays Smith as a schemer who figured that he would lose the Presidential election in 1928 (which he did) , but could use his pliable friend Roosevelt in Albany as a a tool for him to remain on the national stage. Jenkins believes that Smith also figured that Roosevelt may not have lived through his first two-year term. But, the plan went awry. It turned out that Roosevelt had ideas of his own about how to be governor. And these ideas didn’t involve Al Smith. The two friends would become bitter rivals for the rest of their lives. Smith would be one of the leading conservative critics of Roosevelt on the Democratic side. As the Great Depression grew worse and worse during 1932, it was becoming clear that the Democrats were going to be able to win the White House from the extraordinarily unpopular incumbent Herbert Hoover. Roosevelt was the leader on the first two ballots at the Democratic National Convention in Chicago, but did not have the necessary 2/3 majority that the Democrats required. Speaker of the House John Nance Garner along with Al Smith each had enough votes to create a deadlock. But, some behind the scenes maneuvering got Roosevelt the nomination. Breaking with tradition, Roosevelt flew from the Governor’s Mansion in Albany to Chicago (which took over nine hours in 1932) to accept the nomination in person. Prior to this, candidates just waited at home to be told that they had been nominated. Garner was given the Vice Presidential nomination. The election of 1932 was not close. Roosevelt won 57% of the popular vote and 472 electoral votes. The Democrats (and the allied Farmer-Labor Party) picked up 101 seats in the House and 13 in the Senate. Change was in the air. However, Roosevelt would not inaugurated until March 4, 1933, the last inauguration on this date. The country had to wait until then to find out what Roosevelt’s plan would be to solve the economic crisis that was only growing worse. Roosevelt refused to meet with Hoover to discuss plans to bolster the banking system, which was hovering on collapse. There was growing unease that the country could lapse into chaos and social disorder. Unemployment was around 25%. Roosevelt was inaugurated on a Saturday. Banks were closed on Sundays. And on Monday, Roosevelt ordered all banks in the United States closed for the week to allow the Treasury to examine their books to assess their solvency. Roosevelt convened Congress on March 9, and one of its first acts was to pass legislation that actually made Roosevelt’s actions legal. Banks began to reopen in the next two weeks. In the short term, the economy improved a little. However, since it was close to rock bottom, that was not much of an accomplishment. Roosevelt’s programs faced opposition from all sides. Some Republicans accused Roosevelt of unfairly trying to fix the economy by taking money away from the prosperous. There were also demagogues from the extreme right, such as Father Charles Coughlin, a Detroit priest who had a radio show that excoriated Roosevelt for falling in with Jewish-controlled moneyed interests. There was also Senator Huey Long of Louisiana, who mixed wide scale corruption in his home state with populism. Long wanted to “Share the Wealth” although he gave little details on what his plan was. There was also Charles Townsend, a California physician, who devised a plan where elderly Americans (over 60) would receive $200 a month (which they would be required to spend in 30 days) paid for by a national sales tax. Coughlin was eventually muzzled by his local bishop. Long was assassinated in Baton Rouge. Townsend’s plan was preempted by Roosevelt’s Social Security program, which started off paying only $20 per month in benefits. An even bigger problem for Roosevelt was the Supreme Court. Nine of Roosevelt’s New Deal programs went to the Supreme Court and, on seven occasions, they were ruled to be unconstitutional. Even with these problems, Roosevelt had little trouble getting reelected in 1936. The Republicans nominated Kansas Governor Alf Landon. It was the biggest Electoral College wipe-out in American history in any contested election. Roosevelt won 523 electoral votes (and over 60% of the popular vote) to just 8 for Landon. The Democrats ended up with an 80-16 margin in the Senate and a 347-88 margin in the House. The Senate chamber didn’t have enough room to put all the Democrats on one side of the chamber; so, some Senators had to sit on the wrong side of the aisle. With this majority, Roosevelt could have accomplished even more, but he wasted his political capital on a battle with the Supreme Court. Roosevelt, not wanting his New Deal legislation tossed out by a majority Republican court, came up with a plan to add justices to the Court. Roosevelt proposed that the President be allowed to appoint one extra justice for each sitting member on the court who was 70 1/2 years old or over, with a maximum of six. Publicly, Roosevelt said that his plan was simply a way to ease the workload for the Supreme Court. However, almost the entire nation saw it as an encroachment on the Judiciary by the Executive Branch. As a backdrop to all of this was the increasingly tense state of international affairs. Germany had become a Nazi state under Hitler and had rearmed and was taking over territory (Austria and the Sudetenland) and starting wide-scale persecution of Jews. Japan was asserting its dominance in Asia and the Pacific, having already taken over Manchuria. Italy, not wanting to get left out of the action, decided to attack Ethiopia. When World War II finally began in 1939 with the German attack on Poland, Roosevelt somewhat vainly hoped to keep the United States out of the fray. Roosevelt even made a speech where he promised “not to send your sons into any foreign wars.” There was still a strong isolationist movement in the United States, led by Charles Lindbergh among others. Because world tensions were so high, and also because the Democrats didn’t have any candidates on the horizon, Roosevelt allowed himself to be drafted for an unprecedented third term. Henry Wallace would be the new Vice President. The Republicans nominated Wall Street lawyer Wendell Willkie, who didn’t oppose most of the New Deal, but did feel that Roosevelt had not run the economy efficiently. Willkie fared a little better than Landon, but still lost badly. As we know, the United States didn’t stay out of the war. Roosevelt slowly moved the United States over to the British side of the war. First, he traded American destroyers for long-term leases on numerous British naval bases. Then, he developed a plan known as Lend-Lease, where the United States would send ammunition, tanks, and planes to the British. At the end of the war, the British could give them back, or, if the material was destroyed, they could be paid for. It is not believed that the British sent much back unused, or had any money left at the end of the war to pay for what they used. The United States was finally pushed into the war by the Japanese attack on Pearl Harbor on December 7, 1941. Roosevelt asked Congress for declaration of war against Japan, which passed almost unanimously. Hitler then decided to honor a treaty he had made with the Japanese and had Germany declare war on the United States. The United States reciprocated and now the United States was now faced with fighting a war all over the globe. Also, the United States was now on the same side as the Soviet Union, which would prove problematic for the next 60 years or so. In recent years, much has been written and aired about World War II. The History Channel seems to be dedicated to programs about it. So, I won’t be offering much more about the conflict. (It’s just like your high school history class where the teacher tries to jam World War II into one lesson on the second to last day of school. Also, did World War II end the Depression? Discuss amongst yourselves and report back to me.) But, I will point out some of the parts of Jenkins’ book that I found odd. First of all, Jenkins referred to Roosevelt’s plan to intern Japanese-American citizens living on the West Coast to camps further into the interior as “disruptive.” That’s one way of putting it. Jenkins also defended Roosevelt’s treatment of refugees, asserting that the United States took in more Jewish refugees than any other country. Whether Roosevelt’s efforts were enough is not addressed by Jenkins. Jenkins also looks at Roosevelt from a European perspective. And, for someone living in Great Britain, Roosevelt looked like a savior. Jenkins marveled at how much abuse Roosevelt took in the American press during the war. But, in many respects, it was just politics as normal in the United States. In 1944, Roosevelt’s health began to decline. His blood pressure had soared to dangerously high levels. He was suffering from hardening of the arteries. Doctors reported that he looked gray and suffered from lassitude. Nevertheless, Roosevelt decided to run for a fourth term. His opponent would be New York governor Thomas Dewey. Roosevelt decided to drop Wallace from the ticket and replace him with Missouri Senator Harry S Truman. It isn’t believed that Roosevelt was looking for a replacement in case he passed away. Roosevelt probably felt that he had a better chance to win with Truman on board, rather than the increasingly erratic and extreme left-leaning Wallace. Roosevelt won, although by a smaller margin than in 1940. Roosevelt’s fourth inaugural was a brief ceremony, ostensibly for wartime decorum, but also because his health was so poor. Roosevelt had run a strenuous campaign, which had taxed his health even more. But, he knew the war was coming to an end. In February of 1945, he traveled all the way to the Crimean port city of Yalta for talks with Churchill and Stalin. Roosevelt, although younger than both Churchill and Stalin, looked considerably older. The postwar state of Europe was beginning to be mapped out. And the map would end up being quite favorable to Stalin and the Soviet Union. Roosevelt and Churchill were unable to guarantee a democratically elected government in Poland after the war, as well as stop Soviet incursions into the Baltic States. The only “concession” Stalin had to make was to agree to attack Japan 90 days after the surrender of Germany. Upon his return to the U.S., Roosevelt addressed Congress about the conference. For the first and only time, Roosevelt sat down to give his speech before Congress. His health wouldn’t allow him to stand up with braces for any extended period. That speech was on March 1, 1945. Six weeks later, on April 12, 1945, in Warm Springs, Georgia, Franklin Roosevelt died of a massive stroke. Harry Truman became President. On July 16, 1945, the first nuclear weapon was successfully tested in New Mexico. On August 6, 1945, an atomic bomb was detonated over the Japanese city of Hiroshima. Roosevelt’s time was gone, or was it? We are still living with the New Deal. There is still Social Security. There is insurance for bank deposits. The Tennessee Valley Authority still provides power to a large portion of the country. Many of the people reading were not alive while Franklin Roosevelt was in office. But, more so than any other President, his legacy is one that we cannot escape. Other stuff: Franklin Roosevelt was buried at his family home in Hyde Park. It is now part of the Home of Franklin D. Roosevelt National Historic Site. The Franklin D. Roosevelt Presidential Library and Museum is nearby. Eleanor Roosevelt is buried alongside her husband. There is a Franklin Delano Roosevelt National Memorial along the National Mall in Washington, DC. Eleanor Roosevelt was reportedly 5’11” which made her the tallest First Lady in history until she was matched by Michelle Obama. Before his illness, Franklin Roosevelt stood 6’2″. Roosevelt’s first Vice President, John Nance Garner, died 15 days shy of his 99th birthday on November 7, 1967. He is the longest-lived Vice President. Of the four people who ran against Roosevelt for President, three of them outlived him: Herbert Hoover (died at age 9o in 1964), Thomas Dewey (died at age 69 in 1971), and Alf Landon (died at age 100 in 1987.) Wendell Willkie died in 1944 at age 52 of a heart attack. Only two members of Roosevelt’s Cabinet served through all four administrations: Secretary of the Interior Harold Ickes and Secretary of Labor Frances Perkins. The last surviving Cabinet member from Roosevelt’s administration was his first Postmaster General, James Farley, who passed away in 1976. Farley resigned his job in 1940 because he didn’t believe that Roosevelt should have run for a third term.